Mr Kenneth Loder Cromwell Prescott, of Arborfield Court, Berkshire, who died on Sunday, aged 47, was lineally descended from Oliver Cromwell. The last descendent of the Protector in the male line, Oliver Cromwell of Theobalds, died in 1821. His only daughter, Elizabeth Oliveria, married Mr T A Russell of Thruxtons Court, Herefordshire, and her daughter Elizabeth married Mr Prescott’s grandfather. Mr Prescott was born in 1873, son of the late Charles Andrew Prescott. He was an M.A. of Trinity College, Cambridge. He entered the bank (founded by his family in 1766), and on the retirement of his father from the chairmanship, became a director in 1902. Prescott’s Bank, Ltd., eventually amalgamated with the Union of London and Smith’s Bank, Ltd., from the board of which he retired during the war. As deputy chairman of Eley Bros., Ltd., and chairman of the Schultze Gunpowder Co. Ltd., he became a director of Nobel Industries, Ltd. He was also a director of the Atlas Assurance Co. Ltd., with which his family have been connected since its foundation in 1808. For many years he was on the board of management and treasurer of the East London Hospital for Children, and was a member of the General Council of the King Edward’s Hospital Fund. He married in 1911 Elizabeth Marton, daughter of Sir John Shelley, Bart., Skobrooke Park, Crediton, Devon. He was chairman of the Parish Meeting, vice chairman of the Parochial Church Council, and churchwarden of the parish of Arborfield, and a J.P. for Berkshire. He leaves three daughters. Mr Prescott came to reside at Arborfield Court from Basingstoke six years ago. Keenly interested in sport, he became the president of the Arborfield Football Club, and was an enthusiastic supporter of the local cricket club. 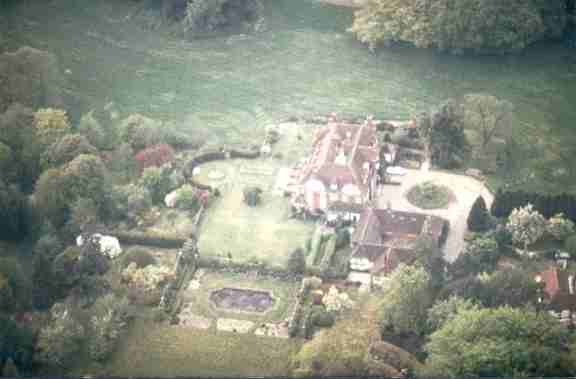 He was also interested in horticulture and spent much of his leisure time in the gardens at Arborfield Court. Having been for many years connected with hospitals in London, he took a prominent part in the local organisation of the Royal Berkshire Hospital contributory scheme, and presided at the inaugural meeting held recently. He was a manager of the Newland, Arborfield and Barkham Schools, and a member of the Standing Committee of the Ruri-decanal Conference. Mr Prescott had been unwell for about three weeks prior to his death, but was improving when a sudden relapse occurred. The news of his death was received with general regret in Berkshire, and by it residents of Arborfield have lost a valued and esteemed friend. The funeral of Mr Prescott took place on Thursday at Arborfield, the Rev. J. A. Anderson conducting the service. [The article contained a long list of mourners]. The interment was alongside the grave of the deceased’s infant son, the grave being lined with ivy. At the request of the deceased there were no wreaths, with the exception of one of his favourite flowers. The funeral arrangements were carried out by Messrs. Garrett Bros., of Arborfield. "Before the commencement of the ordinary business of the Wokingham County Bench on Tuesday afternoon, the chairman (Mr G. A. Watson) referred to the death of Mr Prescott. "He regretted, he said, to have to announce the death of one of the most respected members of the Bench, who had died somewhat suddenly on Sunday after a short illness. His death was a grievous loss to the Bench; he was a good magistrate and a pleasant friend and neighbour; he would ask the Clerk to convey to Mrs Prescott the deep sympathy of the Bench." In 1861, his grandfather Frederick Prescott, an examiner of Army Accounts, lived comfortably at Oxford Square in Paddington with his wife Elizabeth (who is mentioned in the Obituary above). Charles Andrew Prescott and several brothers and sisters lived in the family home despite having grown up long ago. Charles was 32, and was described as a 'Banker and Barrister'. In 1864, he married Emma Catherine Harrison, of Blackheath, and by 1871 they were living nearby at Westbourne Crescent in Paddington. Kenneth Prescott was 5 years old in 1881, when the family and their servants lived at 20 Cambridge Square, also in Paddington. Ten years later, he and his 18-year-old sister Oliveria Cromwell Prescott boarded at Eye Vicarage in Herefordshire with the Rev. Wilfred Buckler, and on Census Day, Charles Prescott, Banker, was a visitor along with Emma. By 1901, Kenneth Prescott, by now a Banker but as yet unmarried, was living with his parents at 20 Cambridge Square.